I was glancing through my old blog posts for InspyRomance.com when I noticed I had written my very first post back in October 2017. That means I’ve had the privilege and pleasure of blogging here for a year now. Wow, time sure flies! I’ve truly enjoyed the community I’ve found with both the authors and readers of this site. I gotta say, our readers (that’s you!) are some of the most supportive and interactive people out there in cyberspace. It’s always a joy to read your comments and to see familiar names pop up every month. The one thing I’ve learned from my indie author journey is the importance of having friends, especially those with the same faith. Writing is such a solitary activity (if you don’t count the voices I hear in my head, haha). Other than my family, the only people I consistently talk to every day are the faces I see online. I’m so thankful social media gives me the chance to connect with friends all over the world, from the comfort of my home. How neat is that? Over this past year, I’ve written five books and revamped/rereleased three, and I have three more novelettes coming out before the end of the year (I write both Christian and sweet/clean romance). I’m currently working on the third book in my Spark Brothers series now, which you all have been so supportive with. As you can imagine, I spend a lot of time in front of a computer screen, so it helps to know there are people on the other side of it running the race with me. You play such an important role in my author journey, which is why I want to say a big thank you and celebrate my one year anniversary with you today! Tell me, what do you do for your special occasions, whether it be an anniversary, birthday or a special milestone? This coming weekend also happens to be my hubby’s and my birthdays (they’re three days apart), so I’d love to get some ideas on things we can do to celebrate. I can’t wait to read your answers! Giveaway: I’d like to give away a digital copy of a book from my backlist (boxed sets excluded). Two winners will be randomly chosen from the comments below. The giveaway will remain open until midnight on Wednesday, October 31st. Hi Liwen, congratulations and happy birthday (s:) How fast a year goes!! I did not know of your books before ‘meeting’ you here, so I am glad you started blogging. My favourite ways to celebrate birthdays etc. would have to be something outdoors- a BBQ, picnic etc. If the weather is not great- then a gathering with friends at home is always fun. Food, family, friends-sounds like a winner! Congratulations Liwen and it has been a pleasure getting to know you through your blogs on Inspy Romance. Happy Birthday. Enjoy your week with family and friends. In our family we usually celebrate birthdays by going out to eat at the birthday person’s favorite restaurant, having a special meal and savoring his/her favorite cake from the local bakery, plus cards and gifts. Birthday celebrations depend on the age of the person and the birthday month. Summer birthdays we have outdoor activities and winter ones more indoor. Your treats are scrumptious and my favorites. Best wishes. Hi Renate! Thank you so much. What great taste you have in treats. :) Oh yes, we definitely plan on getting our favorite cake for our birthdays. Hubby’s is tiramisu; mine is anything with chocolate and nuts. Happy Anniversary! I am so grateful for the friendships I have made through this group, authors and readers!! Hi Paula! Thank you so much. Yes, I definitely agree that this group is a wonderful place to meet new friends. So glad you are one of them! For our kids’ birthdays, we sing ‘Happy Birthday’ and they blow out a candle at every meal. The birthday child also gets to pick a restaurant for a family lunch (we homeschool) as well as what I make for dinner. They also get to open a gift at each meal. These things help spread the celebrating out over the whole day and the kids love it! Congratulations and Happy Birthday. Two super special events. Since my birthday is in December and my husbands birthday is in early February, we now (we are empty nesters) celebrate with a dinner and a movie (birthday persons choice) Our anniversary is in September so we now like to take a week and go someplace where the leaves are turning and do a little out doors stuff. This last September we went to Lake Geneva, WI. It was so pretty by the lake with all the lovely changing trees. We had a ball just walking the shops and staying for a long time over a meal or coffee/tea just talking and planning. We traveled to nearby towns and explored. It was most relaxing and bonding. What every you and your husband do, it will be special and you can make it a bonding time just for the two of you. Congratulations! My husbands birthday is this week also. Usually the birthday person picks a meal or restaurant. He would like to get all the kids together but with everyone’s schedules it’s tricky. We may have to wait a week or two for that. God bless! Hi Diana! Thank you! Oh, happy birthday to your hubby. :) Is he a October or November baby? Hope you guys find some time to celebrate with everyone! Happy birthday and congrats! I usually take my family member out to dinner. I also bake a treat of some kind. Hi Kelley! Thank you so much. :) Ooh, baked treats sound yummy. What do you like to bake? Happy blog-anniversary. :) You’ve had a very busy year! It makes me tired just thinking about it lol. Thanks, Kimberly! Haha, then you can imagine how tired I am. ;) I’m learning how to balance life and reminding myself to breathe more. God willing, I won’t be this tired next year. Happy anniversary. I think I had discovered you even before you joined Inspy Romance! For birthdays we either go out to eat, or fix a special meal at home. For our anniversary, for about the past 10 years, we’ve gone down to Pacific Grove (Calif) and stay at Gosby House, a really special B&B that’s over 100 years old. Since my birthday is close to our anniversary, the two celebrations usually get combined (and if we wait until after the holidays (anniversary is end of Dec, bday is early Jan), we get a second night free). Oh, we’ve been to Pacific Grove, but never heard of the Gosby House. We’ll have to check it out the next time we’re down there. It’s on Lighthouse Ave – is painted yellow and has a big turret. Congratulations. And Happy Birthday I at an age I don’t celebrate my birthday anymore., I love baking cake or cupcakes for daughter and son-in-law birthday there’s are just 3 days apart. Hi Brenda! Thank you. :) How funny that your daughter and son-in-law’s birthdays are 3 days apart, too. Congratulations! Happy Anniversary. Many blessings. Hi Lucy! Thank you so much! God has surely blessed me, and I’m so grateful. Congratulations on your one year and Happy Birthday. Hubby and I celebrated 30 years of marriage at a Victorian Bed & Breakfast. Congrats on your 1 year anniversary! In my family we usually celebrate birthdays with a meal at a restaurant chosen by the birthday person. My birthday is in mid-May so the weather can be iify. This year it was warm and dry, so I went with my brother and sister-in-law to play disc golf, which was fun. Hi Jessica! Thank you. :) And thanks for introducing me to disc golf. I’d never heard of that before! Happy anniversary, Liwen. I’ve enjoyed both Spark Brothers! Hi Sherri! Thank you. :) And thanks for letting me know you enjoyed Aiden and Brandon’s stories! <3 I'm working hard on Colin's book now. Congratulations and Happy Birthday! We usually just got out to eat for our birthdays and wedding a anniversary. With our children we have family over and have dinner with everyone at my mother in law house. Hi Tracy! Thank you so much. :) Sounds like you get to see your family often, which is a blessing! 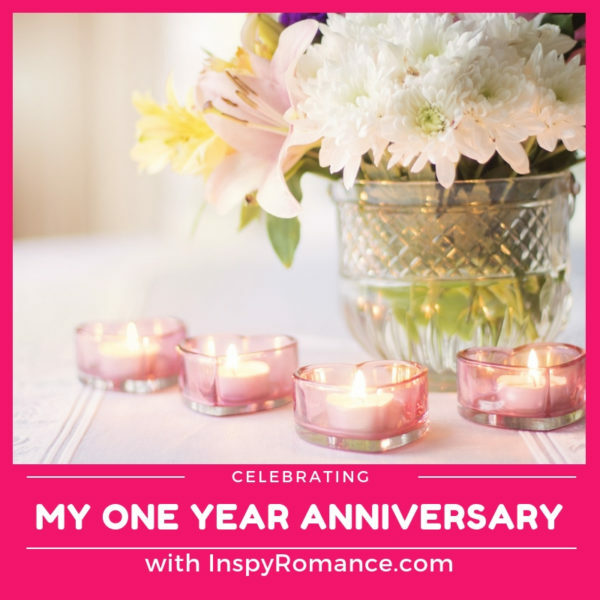 Happy anniversary and many more years with InspyRomance! Wow Liwen, you’ve been quite prolific this year. Great job!